The Malamute was bred by the Eskimos in Alaska. Early history of dogs and development of breeds. CH Sno Klassic Nanuke Knows No Limit (Imp USA), aka Toby, took first place in the working group, Grahamstown dog show 2010. Malamutes have a beautiful thick fur coat and bushy tail to keep them warm in sub-zero temperatures. Grooming keeps the coat tidy. The malamute is a strong-built dog, and was used to pull sleds over the snow. In hot countries like South Africa, the dogs must be kept cool. They are working dogs and love to be exercised and kept busy. They have retained the survival instincts of the wolf, which had to kill to survive. This is not a breed to keep on a farm where there is livestock like chickens. Like us, the dog will enjoy chicken or lamb for dinner! If you are considering an Alaskan Malamute for a pet, it is advisable to find out about training schools beforehand, because the adorable puppy will soon grow up into a domineering handful which requires a strong person to keep it in check. A good dog for a man. The dog is not a barker, which is a disadvantage if you are looking for a watch dog, though it's a definite advantage if you live close to neighbours! The colour may vary but the dogs always have white markings and a white face. It can grow to a height of 71 cms. Spend some time with the breeder to find out as much as you can about the parents before buying a pet to find out if the dog is suitable for your family. If a dog causes trouble, we sometimes put a muzzle over his mouth. Sometimes it's we ourselves who should muzzle our mouths! That's the conclusion King David of Israel came to! He said, "I will watch my ways and keep my tongue from sin; I will put a muzzle on my mouth." 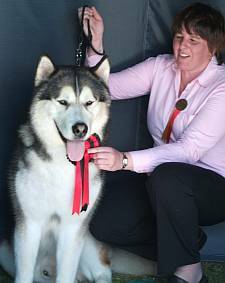 This Alaskan Malamute, Akela, belongs to Karen Laubscher of Melkbosstrand.